Spacewar! was one of the earliest computer games and was written for the DEC PDP-1 minicomputer in the early 1960s. In the game two players fight each other's space ships while navigating around the gravity well of a star. The game was very popular in the 60s and was considered such a good test of the PDP-1's capabilities it ended up being included by DEC for factory and field testing and as part of the demonstration to potential customers. 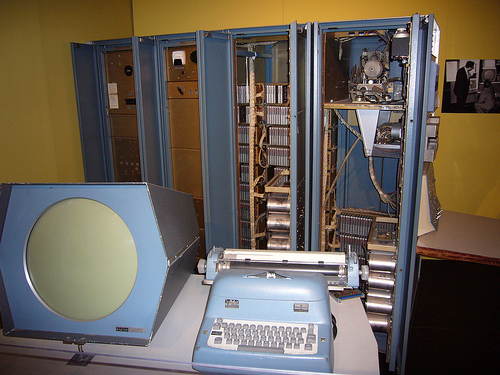 It was ported to a number of other computers and continued to be developed and enhanced though only one PDP-1 is thought to still work these days (in the Computer History Museum) though Spacewar! can still be played on it! Happily you can now play the game in your web browser. Another emulation can be found here. PDP-1 photo from here. You can see the game below.